Campaign for the American Reader: What is K. J. Larsen reading? 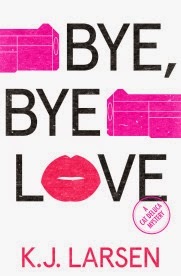 Featured at Writers Read: K. J. Larsen, author of Bye, Bye Love: A Cat DeLuca Mystery. Cat is out running in a neighborhood park when she crashes over the faceless body of Bernie Love. Bernie was the finance guy to the scary Provenza family, with whom he grew up. And friend to Cat’s shady, Ferrari-wheeling-cop Uncle Joey. As she hauls out her phone, Cat is assaulted by someone with a Rolex, stun gun, and wheelbarrow. When the cops show up, the killer is gone. And so is the body. Captain Bob, a stickler for habeas corpus, blows off Cat’s story. Stung by a chorus of snickers from the Ninth Precinct, home base for DeLuca men, Cat vows to make her case and goes after Rolex man. The murderer, desperate to silence the only person who can place him at the park, comes after Cat. She’s quickly on a collision course with the deadliest adversary she’s ever encountered—but she has the help of her beagle partner, her gun-happy assistant, an ex-spy (or two), and her outrageous, interfering Italian family. Meanwhile her hot, FBI-boyfriend seems sidelined in Vegas. Visit K. J. Larsen's website. Writers Read: K. J. Larsen.